The hulking Victorian villa in Edgewater has seen better days. Its muscular concrete porch is cracked, propped up now by iron supports. A rear addition is slowly sinking into the backyard. Inside, a gut job would be needed to make it habitable once more. 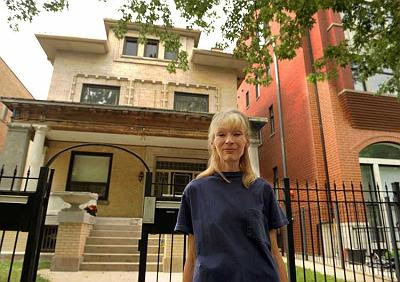 But when members of the Edgewater Historical Society got wind of a developer's plan to buy the yellow-brick behemoth at 6018 N. Kenmore and tear it down to build condos, they rallied to save the place, seeing it as a potential city landmark. What a biased piece of writing. "Hulking Victorian", "behemoth", that it's "uninhabitable." No guessing whose side the journalist is on. The woman suing and the commenters have *no idea* what the property rights laws actually are. She has no case. I'm thinking that the developer is glad he dodged a bullet. His construction loan "fell through" just as the market was beginning to tank. These condos probably wouldn't even be built by now, and if they were, nobody would be buying them, anyway. Its completely unfair, it is the family that own this home, and if she financially cannot afford to fix it up, who has the right to tell her she cannot sell it to whomever she desires. House like these are all over going into a state of disrepair and will entice crime. EHS continually goes too far and trys to bully homeowners - back off or buy it from her is you are SO concerned. The historical society is an organization with a mission to preserve the character and architectural diversity of the neighborhood, and uses standard methods for battling unwise development. It's nothing personal. And the woman did sell the house, and for a very good price over what her family paid for it in the 1960s. I wish I had luck selling my condo in this same neighborhood, but nobody wants it. And we certainly don't need more poorly constructed condos around here anyway. Will they still be standing a hundred years from now, like these old homes? Doubtful.